Polar Design announced today that a project it has worked on with the Mass. 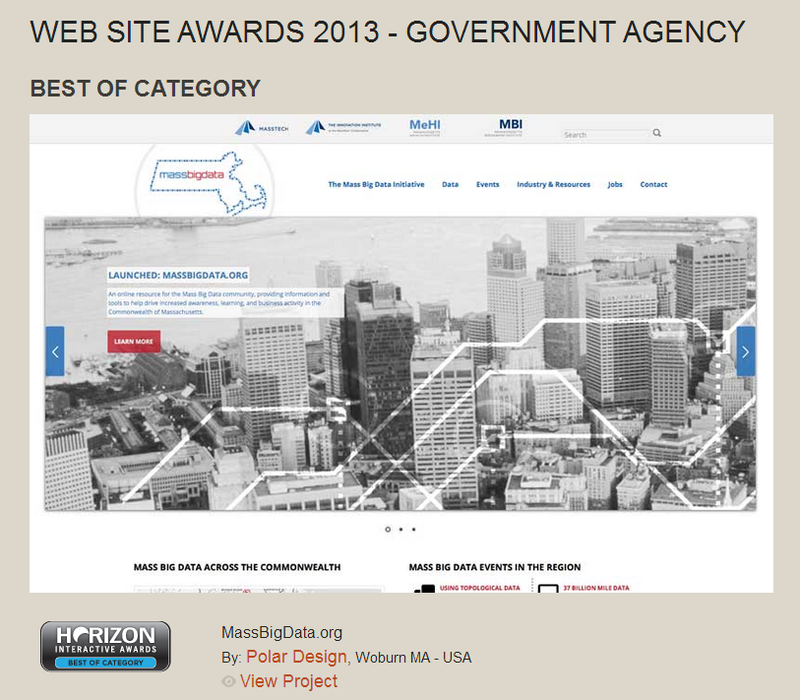 Technology Collaborative and Gopi Bala LLC, won the Best of Category award for Government Web Sites in Horizon Interactive’s 12th annual international award competition. The project is significant in many ways: as an example of how government can successfully bring together public and private stakeholders through digital communications; as a showcase for big data events, jobs, and even visualizations through the sites various interactive features; and as an important step in Polar Design’s 1+ year evolution to assist government agency clients deploy highly advanced, well-designed web sites to meet specialized needs. Developed with Polar Design and Gopi Bala LLC, Mass Big Data’s web site is at the forefront of the growing field of Big Data analytics. The web site encourages use of its plethora of interactive features, including events hosted by various MA companies, a map of big data organizations, a Twitter feed visualization, and a big data jobs board. With these features, MassBigData.org has come to act as a hub for big data innovators, students, and the public alike. Through the web site, these users connect, inspire, and craft novel approaches to handling large data sets. Since its launch in January of this year, the site has steadily grown in popularity. Mass Big Data creates the platform for the public collaboration necessary to unpack and analyze the extensive amount of data available to us today. One of Mass Big Data’s current large-scale projects is the Mass EduData Challenge—a six week program that is focused on identifying new and valuable patterns within education-related data in order to help inform policy within elementary and secondary schools. The EduData Challenge has attracted the attention of the Boston Globe site, Beta Boston, who praised the efforts of civic hacking challenges and the insights cultivated through public participation. Mass Big Data has made it increasingly possible to analyze large data sets much like the one from the MA Department of Education. Other topics tackled with the help of Mass Big Data have included health care and budget reform, transportation improvement, and labor and workforce development. Instituting the Mass Big Data Initiative has placed the Commonwealth at the forefront of the global big data industry, and the MassBigData.org web site is at the core of this enterprise. To learn more about the Horizon Interactive Awards and MassBigData.org, please read our Press Release available in our News section.